One of the most common complaints we hear from patients during their dental checkup is that they’re experiencing sudden tooth sensitivity. Have you ever been eating or drinking something and felt a sudden sharp pain in one of your teeth out of nowhere? This happens to a lot of people and it often happens without warning. The pain is sharp, sudden, and surprising which can leave people wondering what is going on to cause this sensitivity. The American Academy of Endodontists (AAE) describes tooth sensitivity as a brief sensation caused by a stimulus, such as heat or cold, to exposed dentin, the layer beneath the hard, white enamel of the teeth. Tooth sensitivity is quite common and approximately 1 in 8 people experiencing it according to a study published in the Journal of the American Dental Association (JADA). If you’re wondering “why are my teeth sensitive all of a sudden?” you’re certainly not alone. There are several dental conditions that cause tooth sensitivity, most of which involve the loss of protective covering over the dentin. 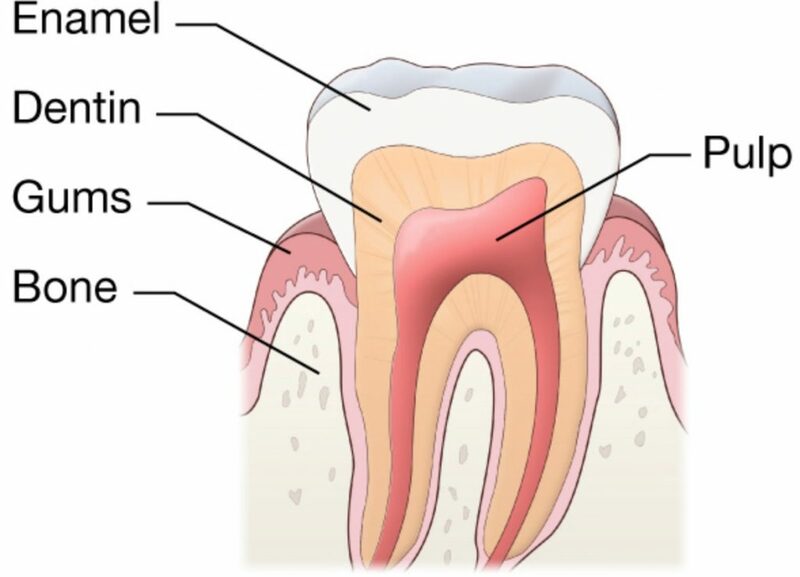 In healthy teeth, enamel protects the underlying layer of dentin, which is softer than enamel. The tooth roots are protected by gums but if the enamel is worn down or if the gum line has receded, the dentin becomes exposed. 1. Brushing too hard or using a hard-bristled toothbrush. If you brush too hard or use a hard-bristled toothbrush you can wear down enamel which will cause the dentin to become exposed. You can help this by switching to a soft-bristled toothbrush and not brushing as hard. Acidic foods and drinks contribute to the erosion of tooth enamel so foods and drinks like soda, juice, citrus fruits, and sports drinks can contribute to tooth sensitivity and trigger that sudden pain. If you grind or clench your teeth (while awake or asleep) you are wearing your tooth enamel away. Tooth enamel may be the strongest substance in your body but it is not immune to the damage done by grinding your teeth. Talk to your dentist about getting a mouth guard that can stop you from grinding in your sleep. Your dentist will be able to custom-make a bite guard to fit your teeth perfectly. The first level of this disease is called gingivitis. With gingivitis, your gums can become inflamed and irritated and they start to recede exposing the roots of the teeth. The root is easily irritated by sensation, so if you have noticed some gum recession this may be the cause of your sensitivity. Most people are surprised to hear this but some over-the-counter mouthwashes and rinses contain alcohol and other chemicals that can make your teeth more sensitive. If your dentin is exposed, this can be even worse. If you are using one of these mouthwashes, switch to a neutral fluoride rinse or just skip the rinse and focus on improving your flossing and brushing. If you are experiencing tooth sensitivity and you’re left wondering “why are my teeth sensitive all of a sudden?” be sure to make an appointment with your dentist so they can find the root of the problem and provide relief.